Analog 0-5V control (unplug XH2.54-3P potentiometer plug signal line connected XH2.54-3P midfoot, ground wire XH2.54-3P rightmost feet). 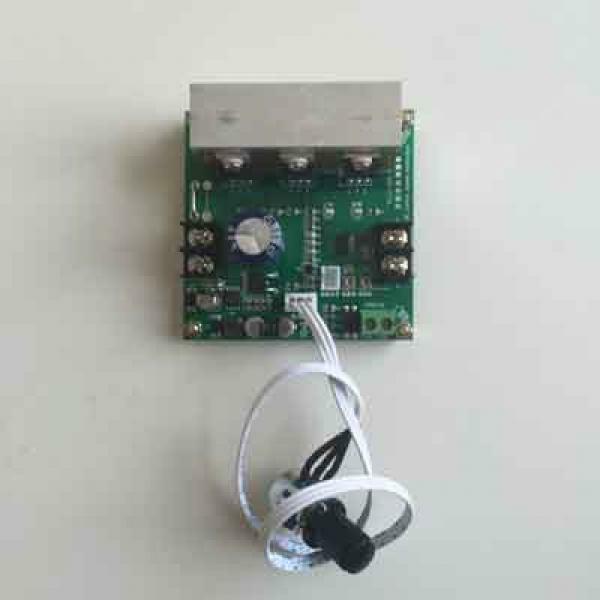 MACH3 interface terminal supports external PWM signal input speed control, external PWM input requirements: level 3.5-12V VPP, frequency 1K-10KHZ, suitable for MACH3 spindle speed control, (note the external PWM control signal need to unplug the XH2 .54-3P potentiometer plug control takes effect, whether the person can not control). Current Rating: 10A, overload and short circuit protection current 12A. (Cut output overcurrent, overcurrent indicator flashes, the potential return light is off, overcurrent lift). Soft start function to prevent the motor starting current moment caused by too much electrical power with damage (default 0 seconds soft start), 0-5 seconds adjustable. The governor in all humane terminals, user-friendly and flexible wiring.